Risotto had been on our list of things to make for some time, and a few months ago the slow-motion shots of a Venetian chef flipping risotto on Anthony Bourdain: No Reservations finally compelled us to buy arborio rice. Since then, we've had three very successful risotto endeavors. Before Michael left, we finished off the arborio rice with our highest quality risotto yet. Homemade stock, a whole stick of butter, saffron, shrimp and scallops, and real Parmesan Reggiano. Michael found a Giada De Laurentiis recipe that we modified by adding Italian sausage and locally grown mushrooms. We knew our additions would work well after only 10 minutes of cooking. With just butter, rice, chicken broth and red wine in the pot, I could almost taste the un-added mushrooms. Sure, the brown fungi and brown sausage didn’t do much for the presentation of creamy brown risotto, but the flavors were spot on. As we ate the finished product, no one could imagine the dish with out the heartiness and slight spice of the sausage. Melt the butter in a heavy large saucepan over medium heat. (We used a big stockpot.) Add the onion and saute until translucent, about 8 minutes. Stir in the garlic and saute for 30 seconds. Stir in the rice and cook for about 2 minutes until the rice is toasted. Add the wine and stir until it is absorbed, about 1 minute. Add 3/4 cup of hot broth; simmer over medium-low heat until the liquid is absorbed, stirring often. Repeat, adding 3/4 cup of hot broth 2 more times, stirring often, about 12 minutes longer. At this point, the risotto can be made 4 hours ahead. Refrigerate the risotto (the rice will still be firm) and remaining broth, uncovered, until cool, then cover and keep them refrigerated until ready to proceed. Bring the remaining broth to a simmer, then cover and keep it warm over very low heat. Brown sausage in a separate pan. Stir 3/4 cup of hot broth into the partially cooked risotto over medium heat until the broth is absorbed and the risotto is hot, about 3 minutes. Add the remaining broth and simmer until the rice is just tender and the mixture is creamy, about 5 minutes longer. Add chunks of sausage and chopped mushrooms. When rice is at the right consistency, stir in the peas and parsley. (We added our peas too soon, so they lost their bright green color.) Add the 1/2 cup of Parmesan. Season, to taste, with salt and pepper. Spoon the risotto into bowls. Sprinkle additional cheese over and serve. Serves 4. Michael took the reins on this one. It was certainly prettier than our first risotto, and totally different, but just as good in taste. The tomatoes melted into almost nothing, but the bell peppers stayed just firm enough and offered a nice bite of sweetness. The chicken was salty and a bit spicy from red pepper flakes. Bring the broth to a simmer over medium-high heat. Cover the broth and keep it warm over very low heat. Dice the bell pepper and tomatoes, and set aside. Melt the butter in a heavy large saucepan over medium heat. (We used a big stockpot.) Add the onion and saute until translucent, about 8 minutes. Stir in the garlic and saute for 30 seconds. Stir in the rice and cook for about 2 minutes until the rice is toasted. Add the wine and stir until it is absorbed, about 1 minute. Add 3/4 cup of hot broth; simmer over medium-low heat until the liquid is absorbed, stirring often. Just keep stirring and adding 1/2 cup of broth at a time as the rice absorbs the liquid. When you have used a little more than half the broth, stir in the diced tomatoes and bell pepper. Keep stirring and adding broth 1/2 cup at a time until all the liquid has been absorbed, the rice is just tender and the mixture is creamy. Stir in grated cheese. Remove from heat and cover. In a skillet with a little olive oil, cook chicken pieces with salt, pepper and red pepper flakes. When cooked through, serve on top of risotto with parsley (fresh basil would be really good, but we didn't have it) and more grated cheese. Clean and peel the shrimp. Cut the scallops if needed. Dice the tomatoes, and set aside. Chop the onion. Melt half the butter in a heavy large saucepan over medium heat. (We used a big stockpot.) Add the onion and saute until translucent, about 8 minutes. Stir in the garlic and saute for 30 seconds. Stir in the rice and cook for about 2 minutes until the rice is toasted. Add the wine and stir until it is absorbed, about 1 minute. Add 3/4 cup of hot broth; simmer over medium-low heat until the liquid is absorbed, stirring often. Just keep stirring and adding 1/2 cup of broth at a time as the rice absorbs the liquid. When most of the stock has been used, melt the remaining butter in a large skillet. Add seafood and cook until shrimp turn pink. When nearly cooked through, add seafood to the risotto pot. Add saffron to the remaining broth. Keep stirring risotto and adding saffron broth 1/2 cup at a time until all the liquid has been absorbed, the rice is just tender and the mixture is creamy. Stir in grated cheese. Remove from heat and cover. Slice basil and prepare bowls for serving. Top dish with the basil and more grated cheese. Reminiscing about these dishes with pictures is making me salivate! 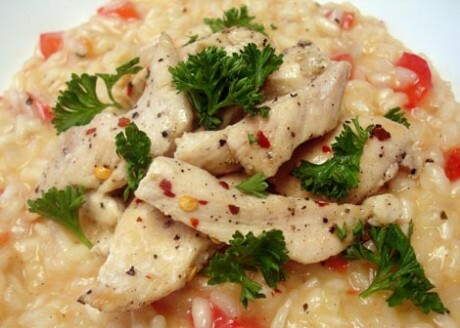 MmM risotto… always sssooo creamy and sssoooo good! I could live off of risotto. These all look and sound awesome, particularly the shrimp and scallop one. yum!! Wow that shrimp and scallop risotto looks SO gourmet! Being from Asia, I used to think adding butter to rice was such a strange concept but now I TOTALLY get it! Wow!!! I think they all look great, but I am definitely partial to that shrimp and saffron risotto! Gorgeous job! Arborio rice is an Italian short-grain rice. It is named after the town of Arborio, in the Po Valley, where it is grown. When cooked, the rounded grains are firm, creamy, and chewy, due to its higher amylopectin starch content; thus, it has a starchy taste but blends well with other flavours. 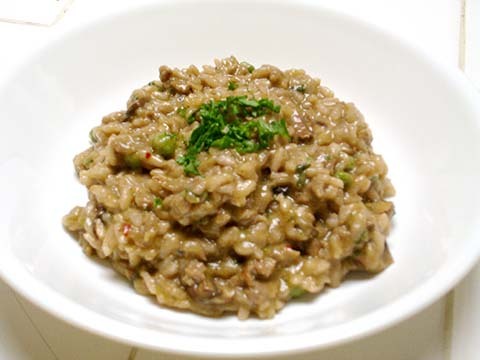 It is used to make risotto, although Carnaroli, Maratelli and Vialone Nano are sometimes used to prepare the dish. Arborio rice is also used for rice pudding..